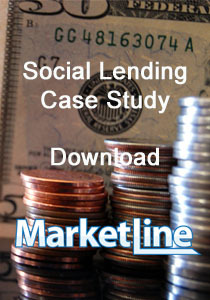 The social lending operation is based on one simple yet revolutionary principle - people lend money to each other. Social loans have enjoyed considerable popularity in 2013; demonstrated by sharp increases in the monthly level of social lending operations and continuous activity on websites mediating this type of operation. In fact, social loans have been developing successfully over a number years. prompt expansion of this way of financing. Download now, and see how MarketLine content keeps you at the forefront of market knowledge.